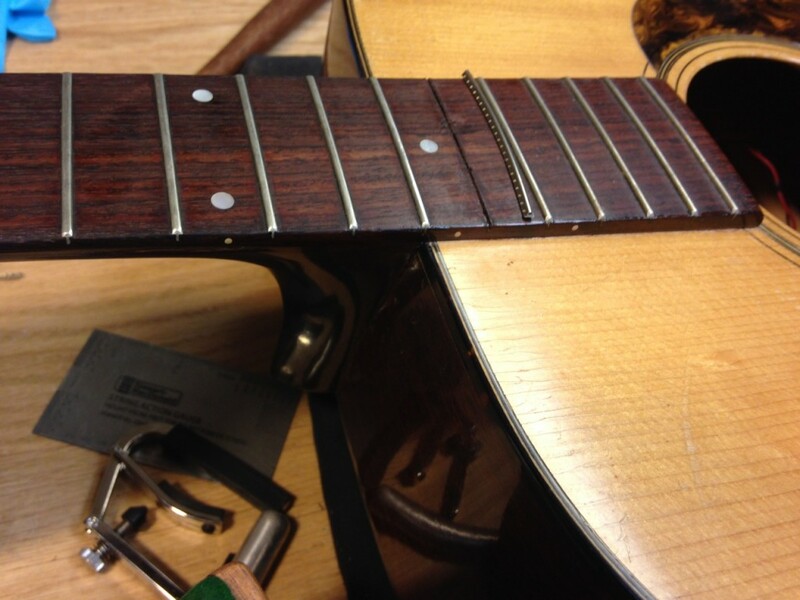 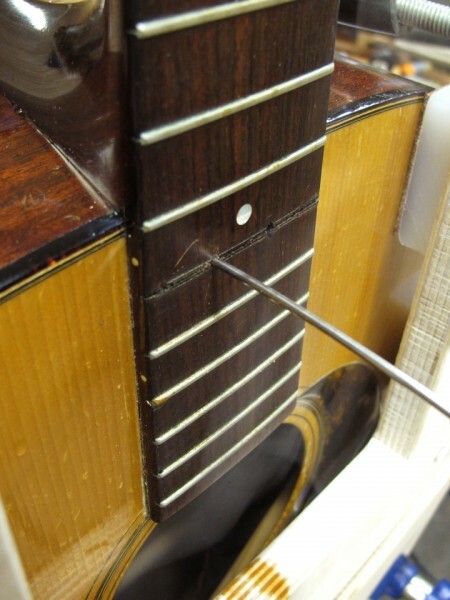 I thought it would be fun (and informative) to illustrate the way I perform one of the more challenging, yet inevitable, repairs that eventually comes to all steel string acoustic guitars — the neck reset. 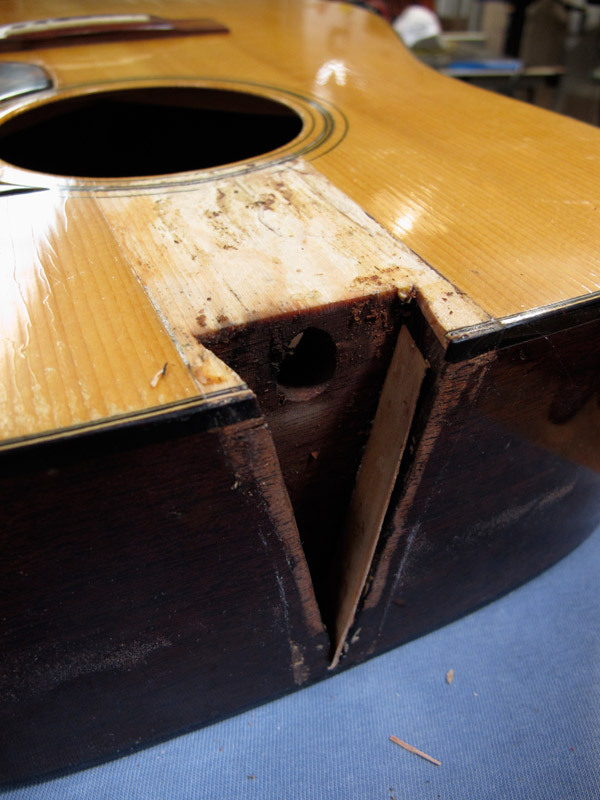 I say inevitable because, wood being a somewhat elastic, plastic material, over time will invariably succumb to the perpetual pull of the strings and will “belly up” behind the bridge, and sink down in front. 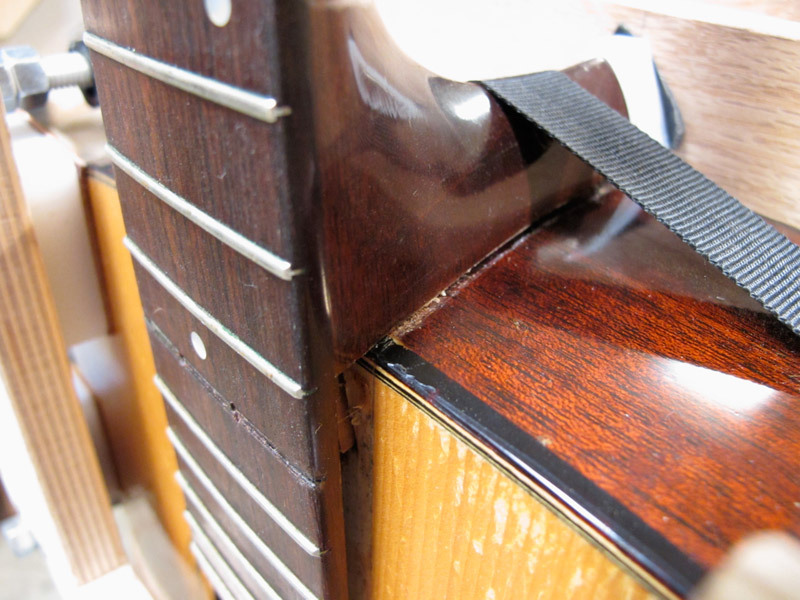 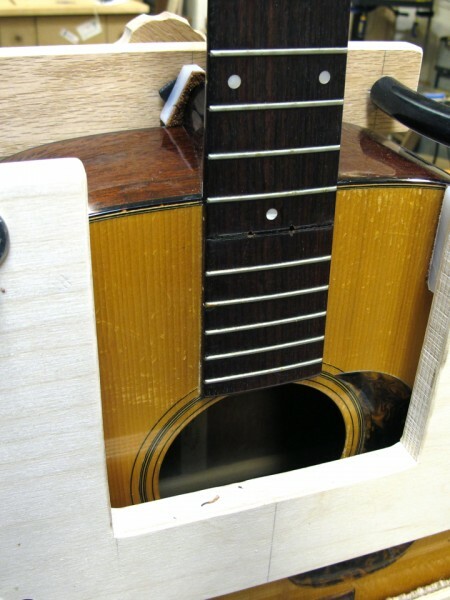 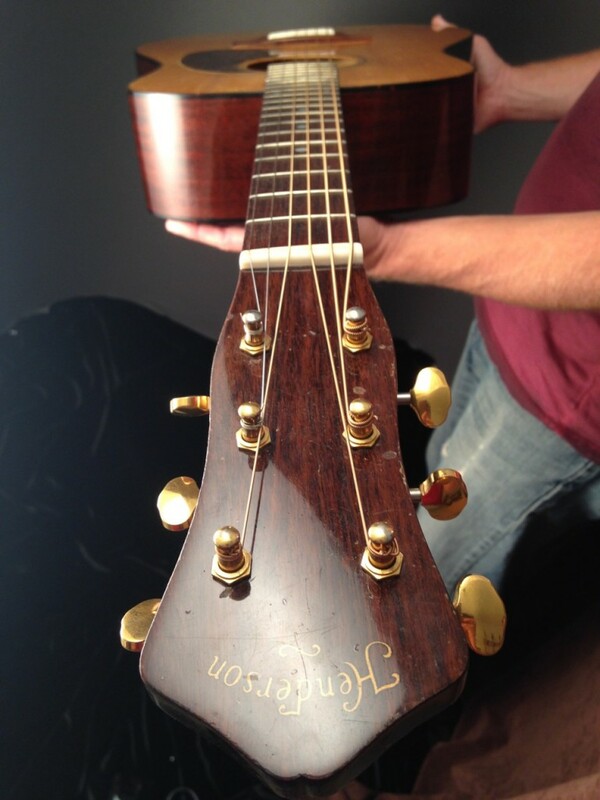 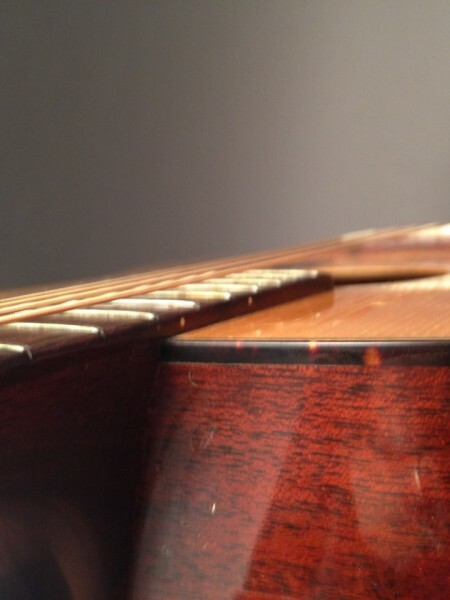 Also, the fingerboard extension tends to dive into the soundhole, often cracking the top along the way. 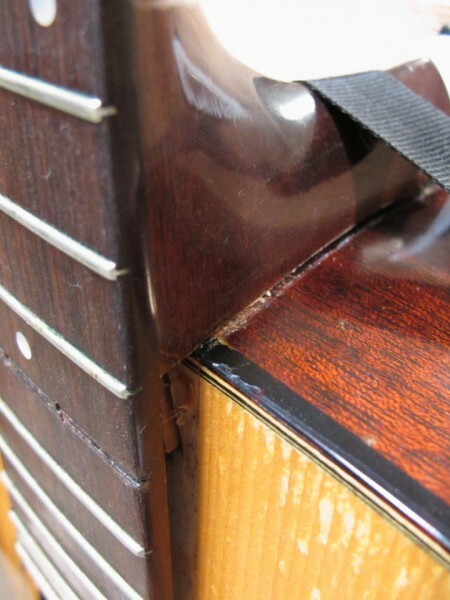 The end result is the gradual rise in the action of the guitar, and let’s face it, who wants to fight against an unnecessarily high string action? 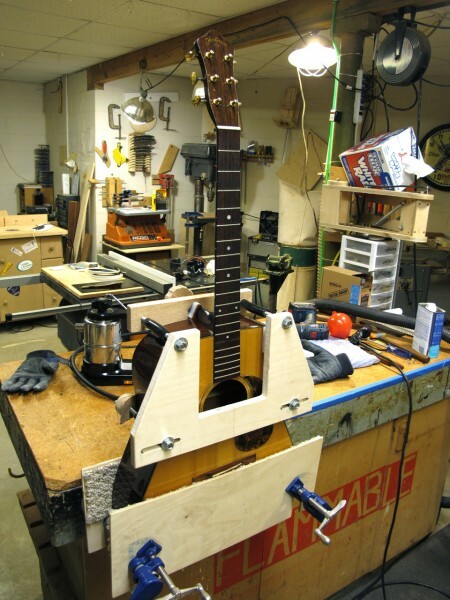 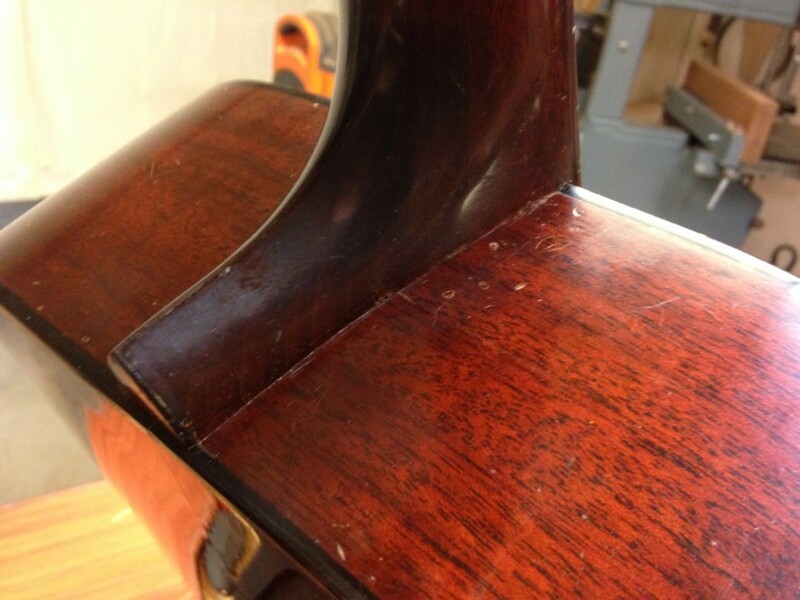 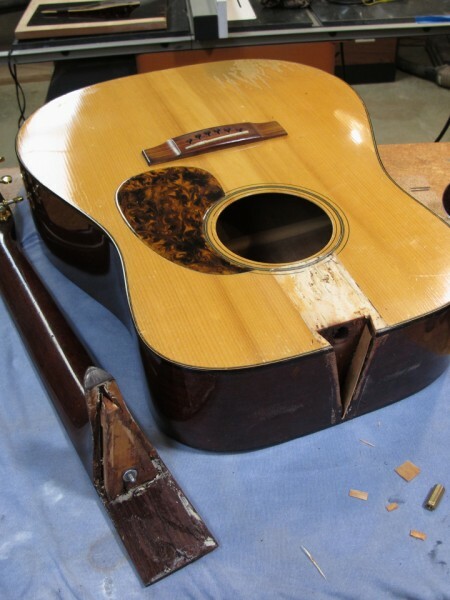 The solution is to remove the neck, change the angle relationship between the plane of the heel and the shoulder of the guitar body, then reattach the neck. 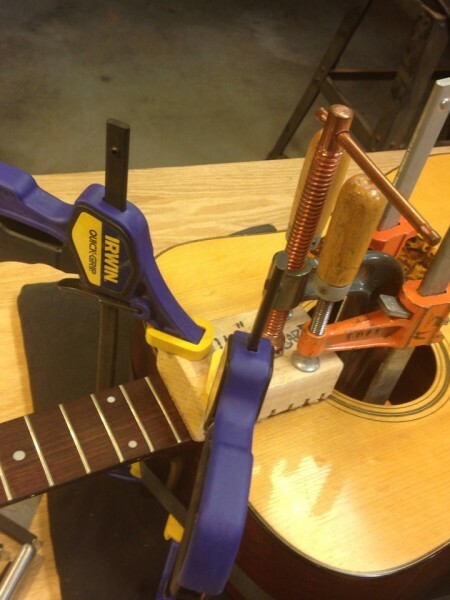 Sounds easy, huh…? 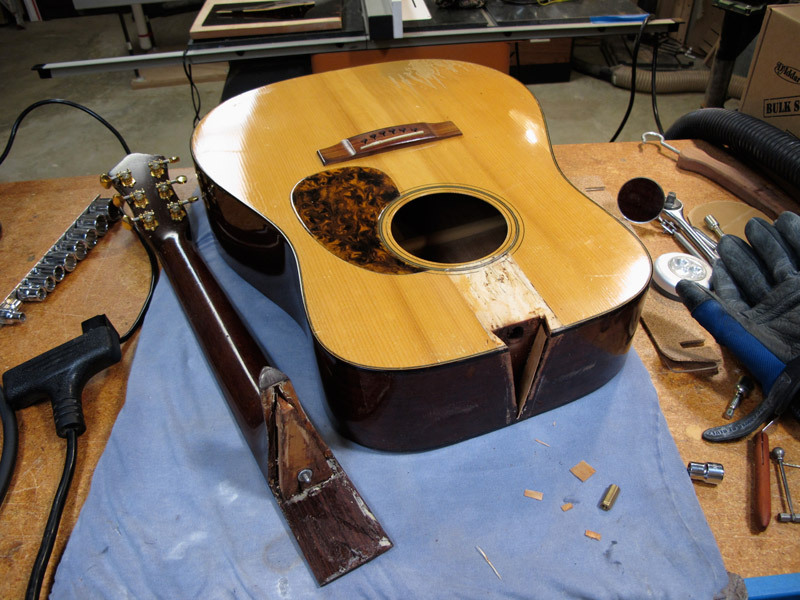 This patient happens to be a really sweet, well-loved Wayne Henderson D-18. 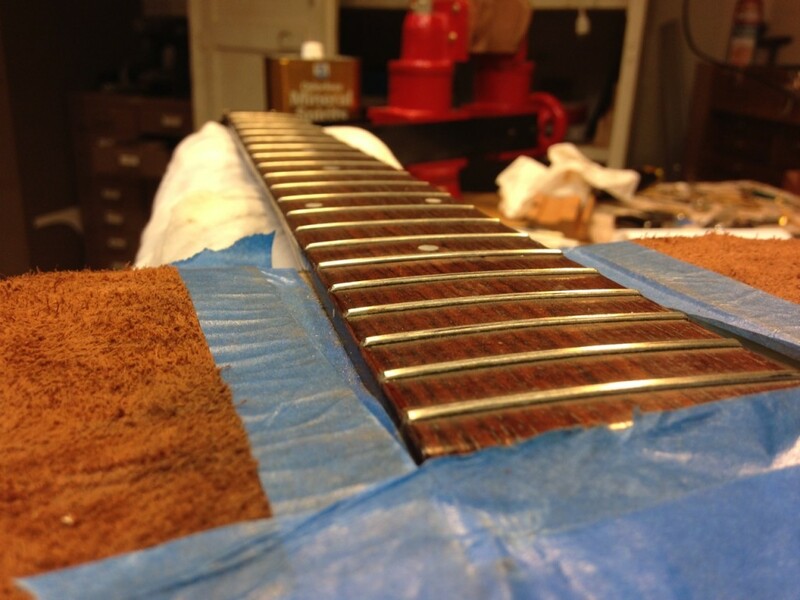 Wayne is one of the most in-demand builders in the country, and one of the nicest guys you could hope to meet. 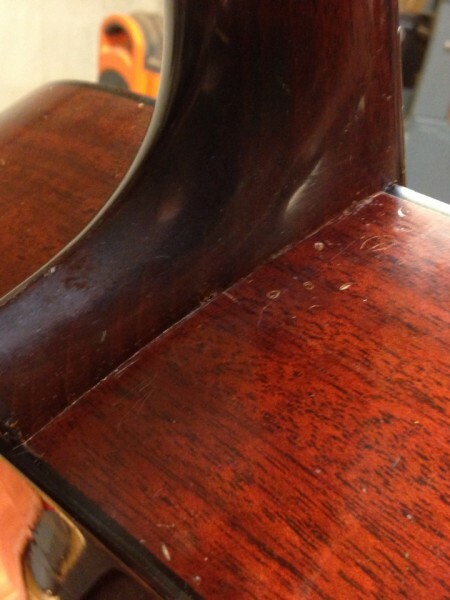 He makes fantastic flattops in the tradition of the great pre-war Martins. 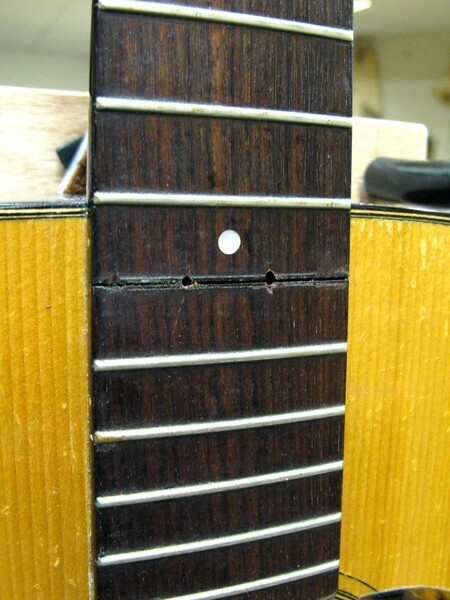 The first step is to heat up and remove the fingerboard extension from the top. 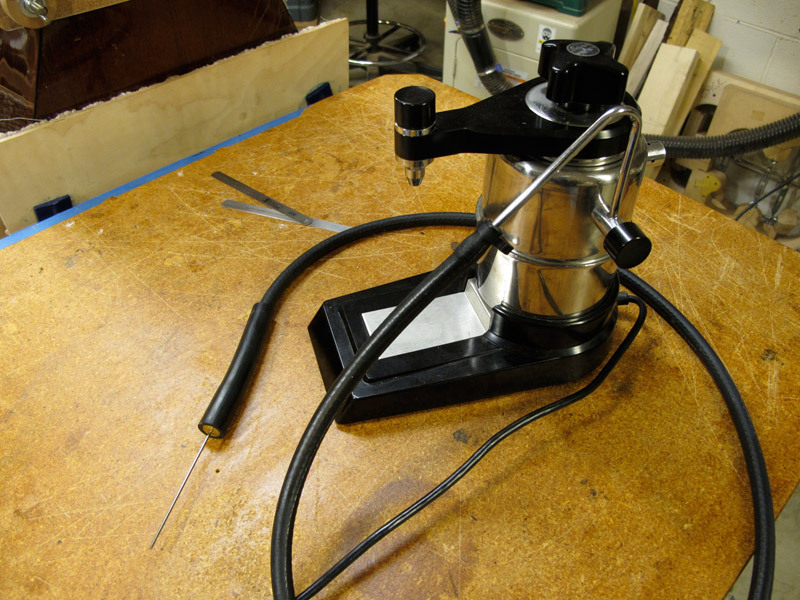 I have a very small silicone heat blanket just for this purpose. 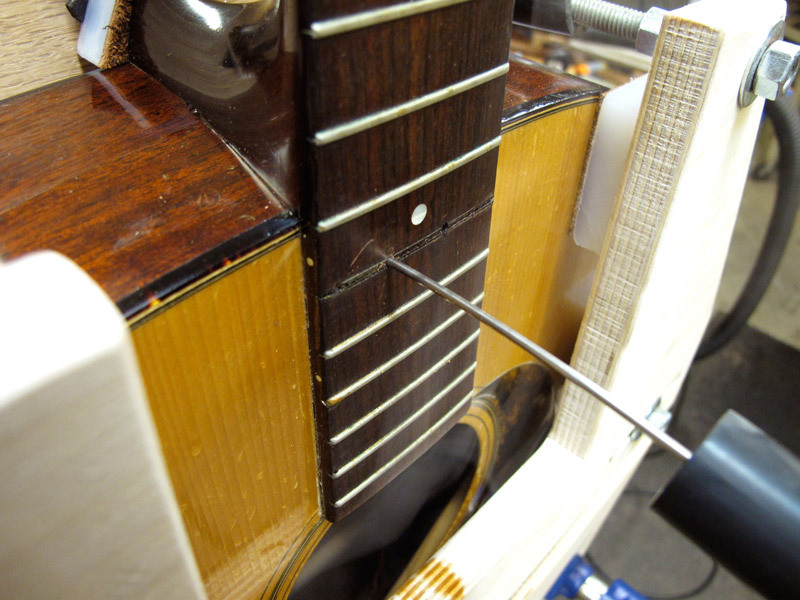 The extension is heated from the top surface, and after ten or fifteen minutes, the heat works it’s way through the extension and softens the glue that’s used to attach it to the top. 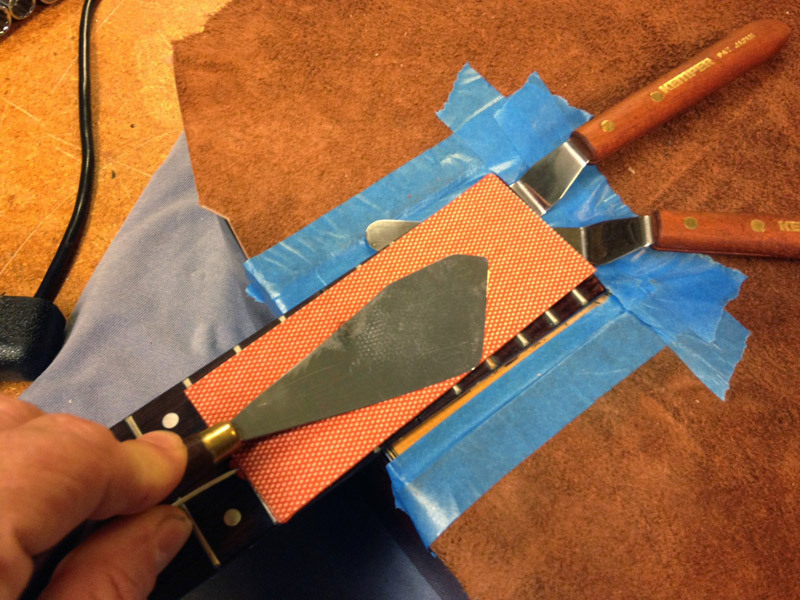 Then I can work several small palette knives underneath and eventually, fully separate the extension from the top. 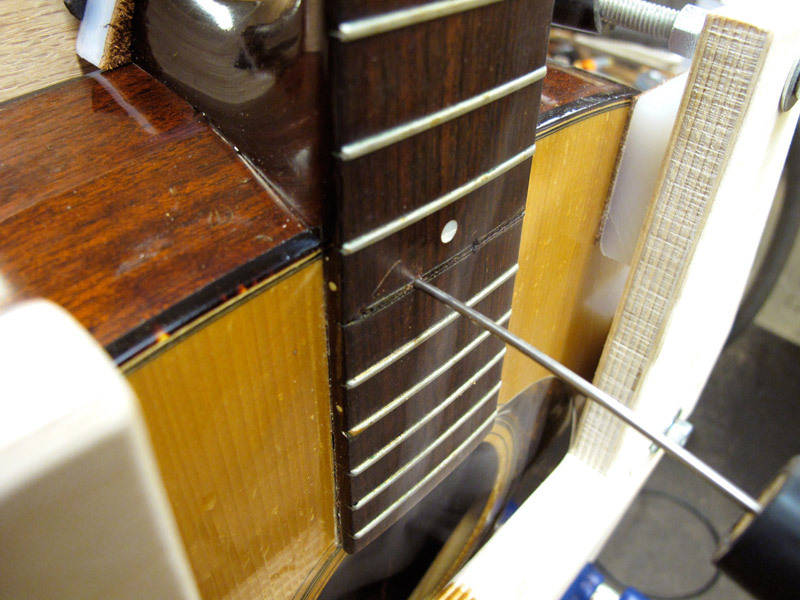 Then I very carefully remove the fifteenth fret where I’ll drill two small holes to access the dovetail pocket. 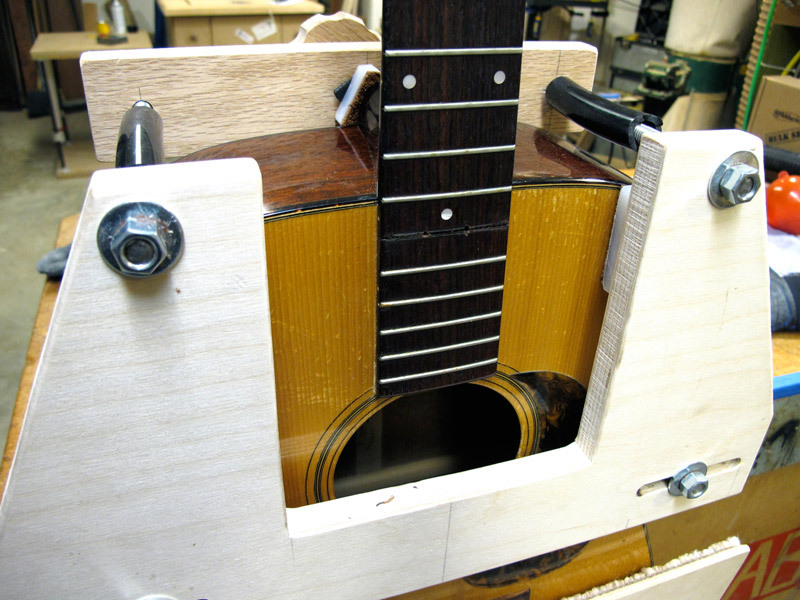 Then I attach my newly minted neck removal jig to the guitar. 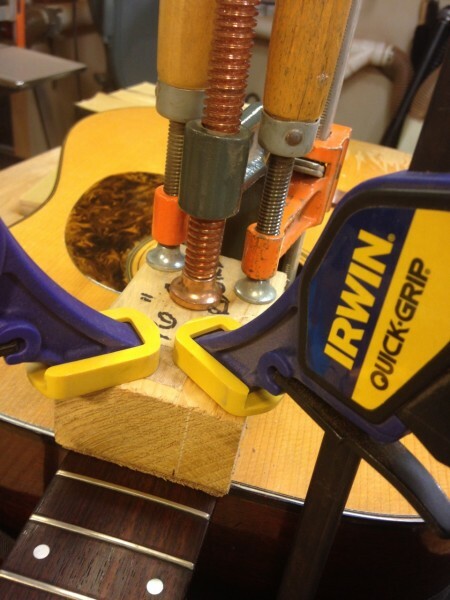 This tool secures to the shoulders of the guitar and enables me to apply gradual increased pressure to the end of the heel, which frees the glued dovetail from the pocket. 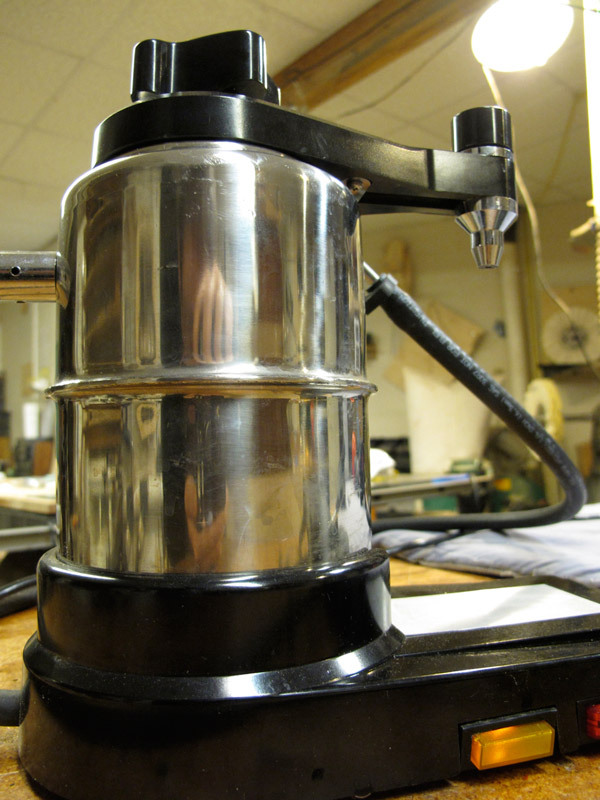 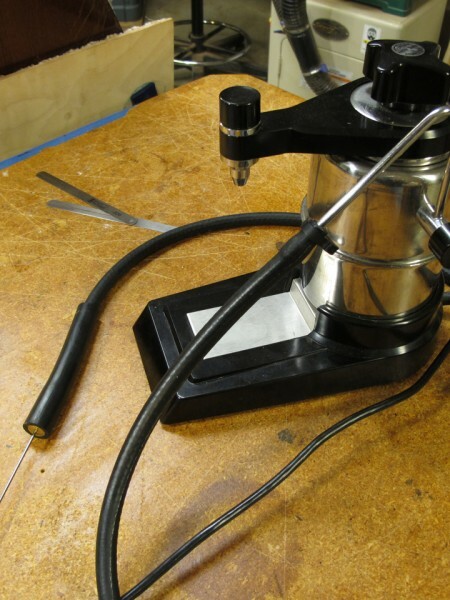 What enables me to soften the glue is the use of steam, supplied via my groovy little Italian-made espresso steamer and fed through tubing and a very skinny piece of steel tubing. 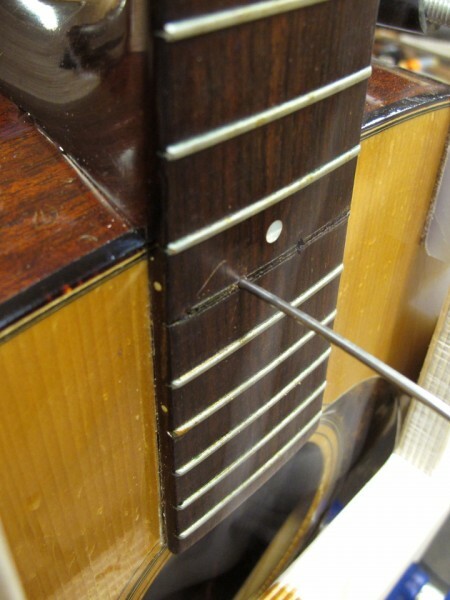 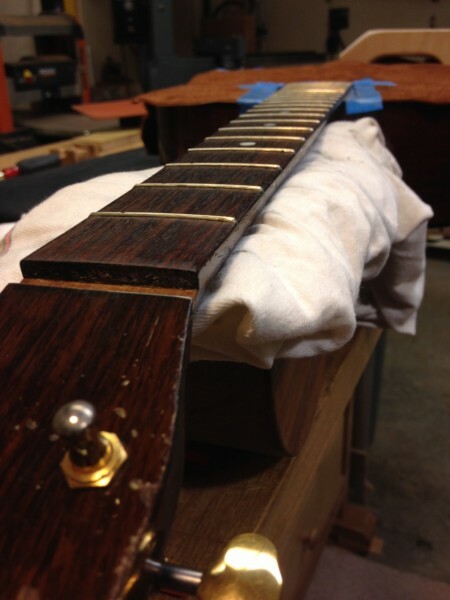 That’s what the holes drilled in the fret slot are for — one for the needle, and one to allow the steam to escape. 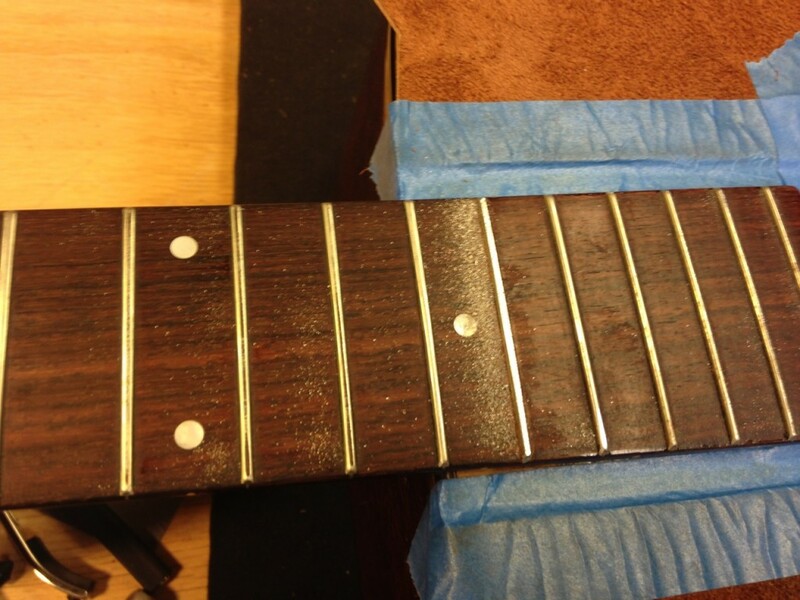 Next, the glue residue will be cleaned off all surfaces, and once the dovetail has had time to dry completely, I’ll move on to calculating the change in neck angle to deliver the proper string height over the frets and bridge. 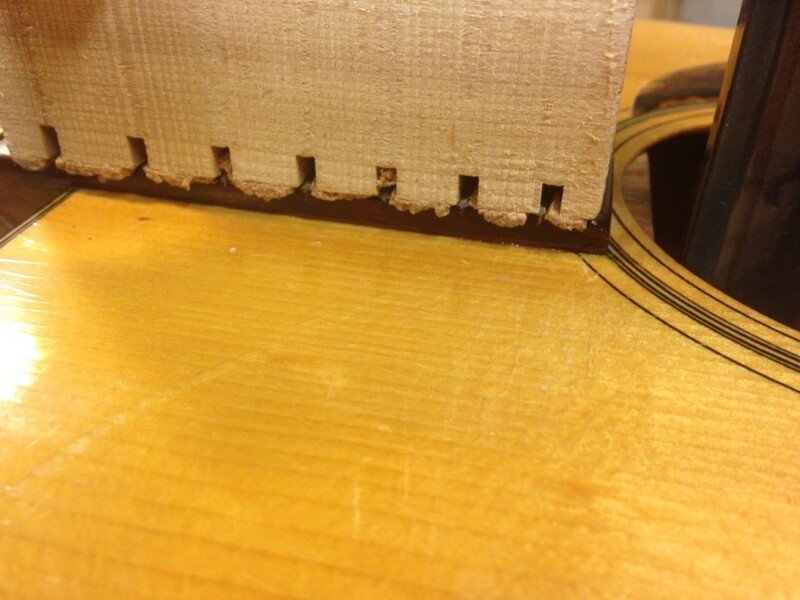 Next, I cleaned up the old glue residue, and calculated the change in angle needed to achieve the proper string height over the soundboard. I then used an extremely sharp chisel to introduce that change into the heel of the neck. 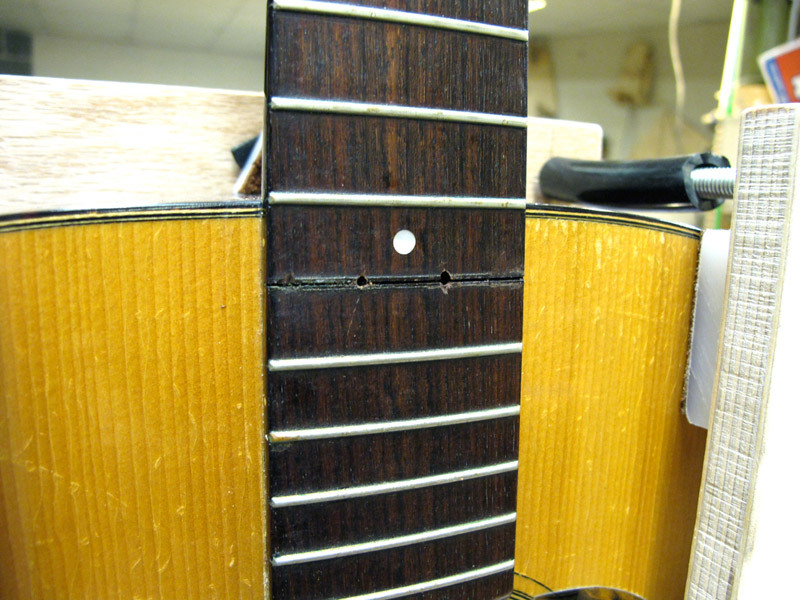 This, of course, changed the relationship of the dovetail to the pocket, so I needed to adjust the shims to account for this change. 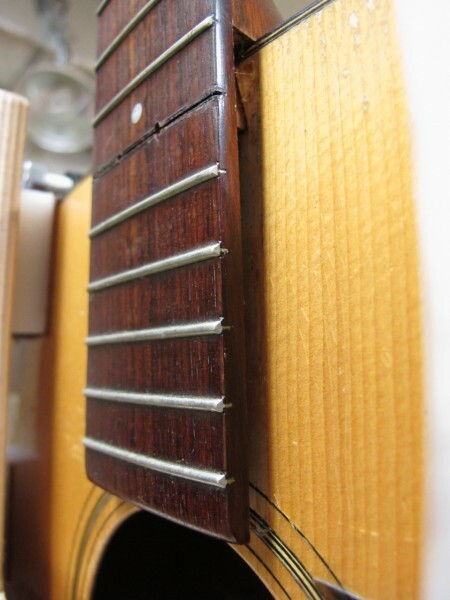 Also, because I was changing the relationship of the fingerboard extension to the top of the guitar, I needed to make a shim that took up that gap under the fingerboard. 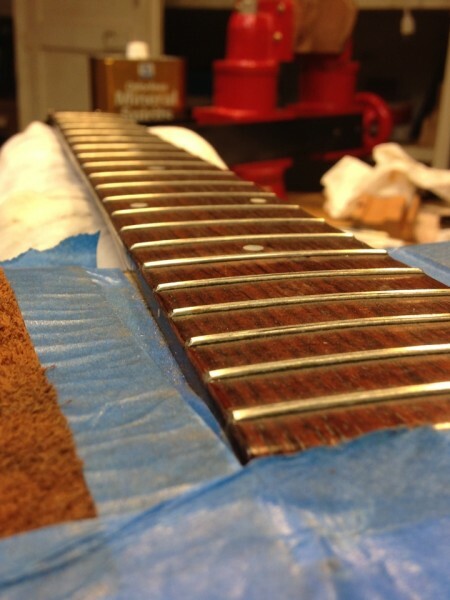 I like to match it closely to the fingerboard material, and in this case, Honduran Rosewood fit the bill perfectly. 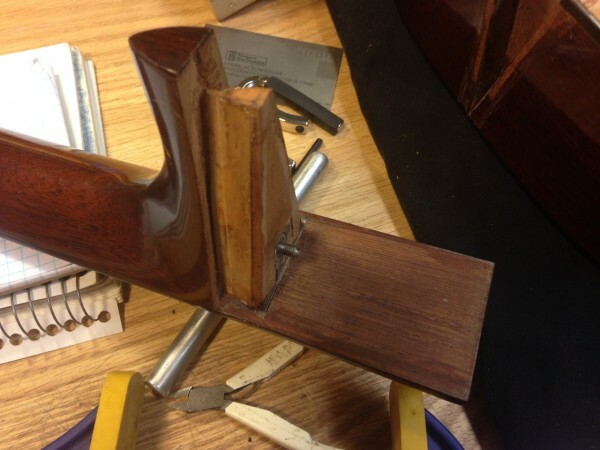 Once I’ve glued the shim, it’s time to floss the heel, which telegraphs the exact shape of the body onto the shoulder of the heel,and ensures a clean heel/body joint. 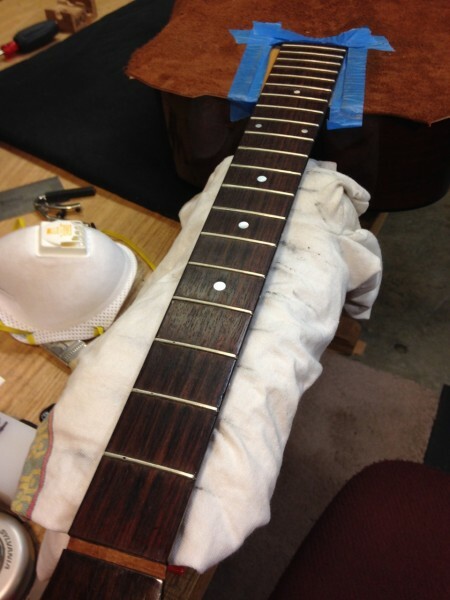 Then I can do any final finish touchup that is easier done before joining the neck. 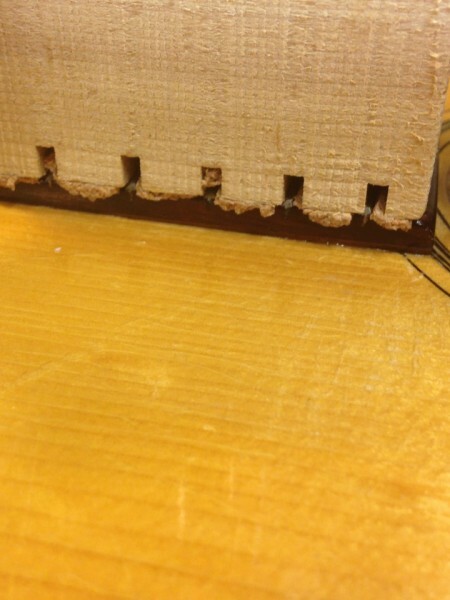 When those tasks are taken care of, I focus on making a new shim for the dovetail that pulls the heel in tight to the body; that’s the beauty of a dovetail neck joint — if it’s well fitted, it’s incredibly strong and secure. I prepare for the glue-up, with hot hide glue, of course, and then go for it. 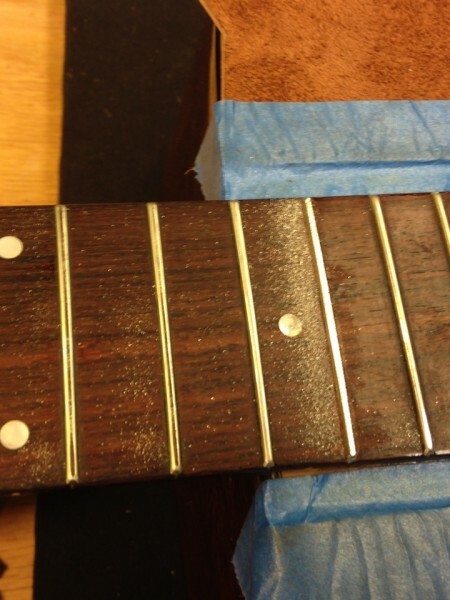 Time is of the essence, and hide glue is impatient, so I’ve got to move quick. 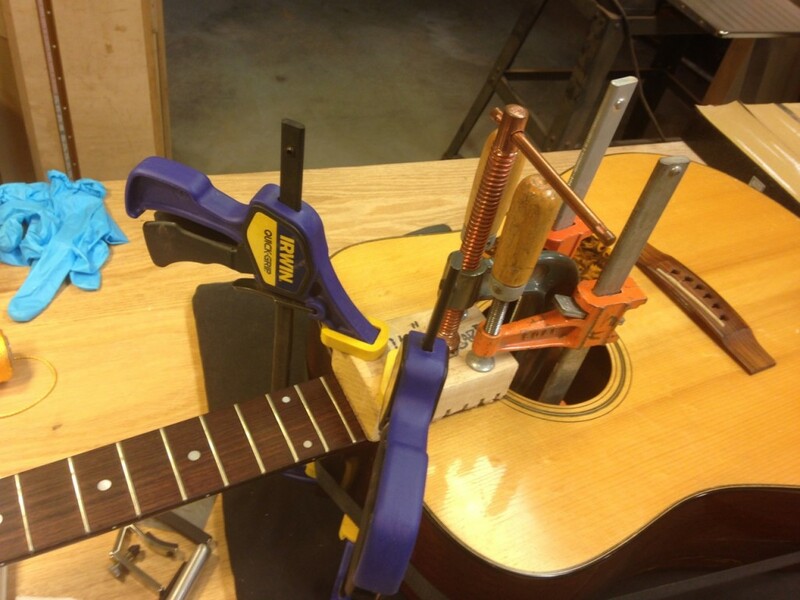 Once I have my cauls in place — one inside the guitar under the fingerboard extension, and one on top of the fingerboard, I get all my clamps in place, crank ’em down, then attend to any cleanup that’s accessible. 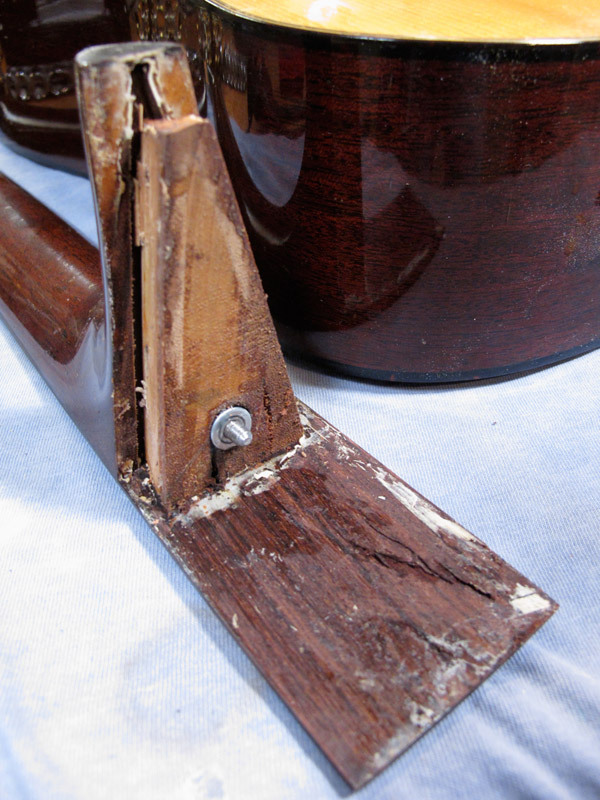 If your not familiar with the neck joint on this guitar their is a video on Utub of this very model being repaired as its different using dial rod. 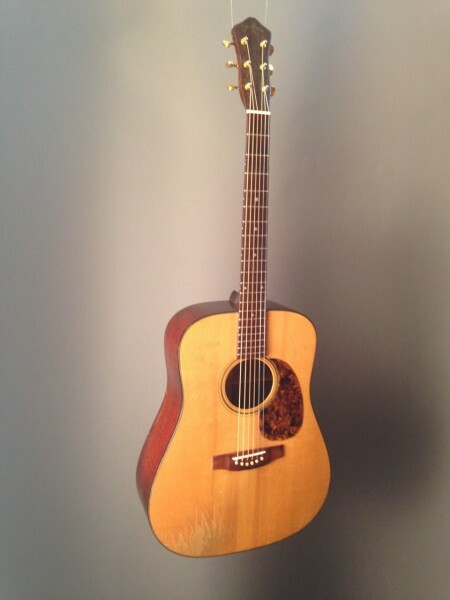 Just wanted to see your reply and if interested a ball park cost. 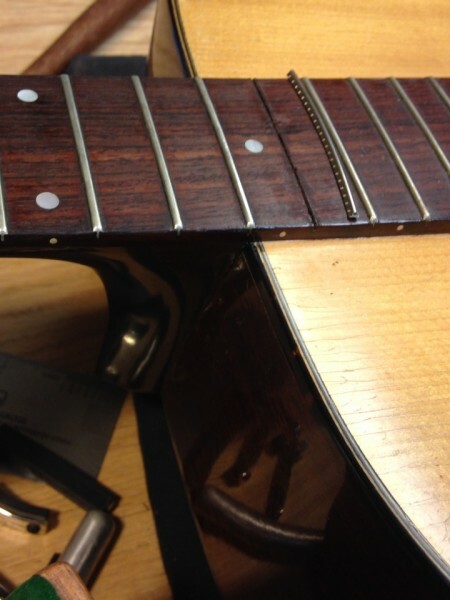 Thank you for sharing your detailed article on a neck-reset. 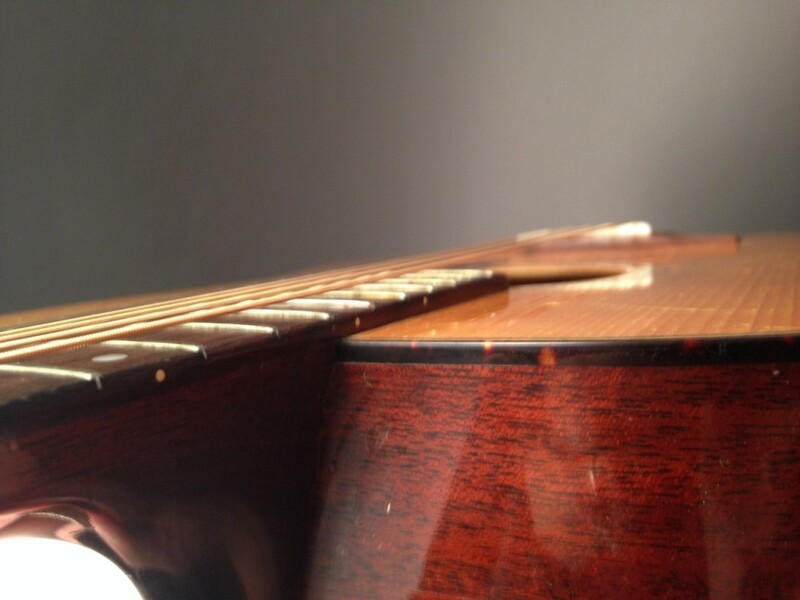 It is a great one!